Erivum Puliyum has crossed 1,000,000 page views recently and I noticed it yesterday !!! A very happy moment to me and I would like to thank each one of you who have been/had been part of this space at some time or the other during this wonderful journey.A big word of thanks who have liked/followed my page on facebook,pinterest,google plus and twitter account.A note of appreciation to all who have shared this page to their family and friends.Initially(in 2011) when I started this blog,I never was bothered of followers,page views,likes on facebook page and it was a slow pace start though I had been updating the page regularly.This page was never created to show how much I cook but was just to inspire others to learn simple healthy dishes which can be recreated at home with your love and passion and to preserve my tried,tasted recipes.This page is my online diary of recipes that has been open to all who love cooking and wish to learn cooking.I hope the tour was interesting; any valuable suggestions,healthy critique is always welcome.Thank you all once again-readers,friends,followers and my dear family members who have been a big support throughout this travel. If you're making homemade paneer,then use this link here to make paneer. In a heavy bottomed non stick pan,add the avocado pulp and sugar,heat it.Cook till it starts reducing and becomes thick. Powder the cardamom and chop the almonds/pitachio.Keep aside. Add the crumbled paneer in this and keep stirring till it becomes thick and starts to leave the sides of the pan.Switch off flame and add the cardamom powder,mix well. Grease a plate with ghee and transfer the mixture to the plate.Spread it evenly(dip a spoon in ghee and using the back of the spoon,make it even) in 1 " thickness. Garnish with chopped almonds or pistachios.Press down with the back of the spoon gently. Refrigerate for 2-3 hours until firm.Cut in squares and serve !! * You can use condensed milk instead of sugar. * I have used homemade paneer.You can use store brought cottage cheese/ricotta cheese or paneer for this recipe. * If you wish to replace avocado with mangoes or any other fruit,go ahead and try with the same quantity measures. for more sweet recipes,click here. Dear Julie, congratulations for your million of visits. You've started your blog the same year as me and you've just doubled my visits. Be happy, your effort and fantastic recipes and work, deserve it. This avocado recipe is fantastic. The different cultures and countries we come from enrich each other knowledge. I wish to be able to cook one of your recipes if I can find all the ingredients. A big kiss & hug from Valencia. oh mouth watering kalkand ...Def a healthy treat as you say .Visit my blog when you find time julie . Sounds inviting......... Tasty and yummy kalakand !! Wonderful colour and great ingredients; congrats on 1000 000! Congrats! Love the figure and the delicious green and yummy avocado kalakand is a delicious fusion . great one. Once again wishing you many more milestones. Stunning and very attractive Kalakand, congrats and way to go Julie. Wonderful recipe Julie..and congrats on your milestone!! congrats julie, such a wonderful post..
Congrats on the milestone!! I liked the vibrant green color of the kalakand. Just wondering if the color of the avocado changed or not since it easily changes the color if exposed to air. Thanks Julie, I will try this recipe!! Julie, congrats on your million. 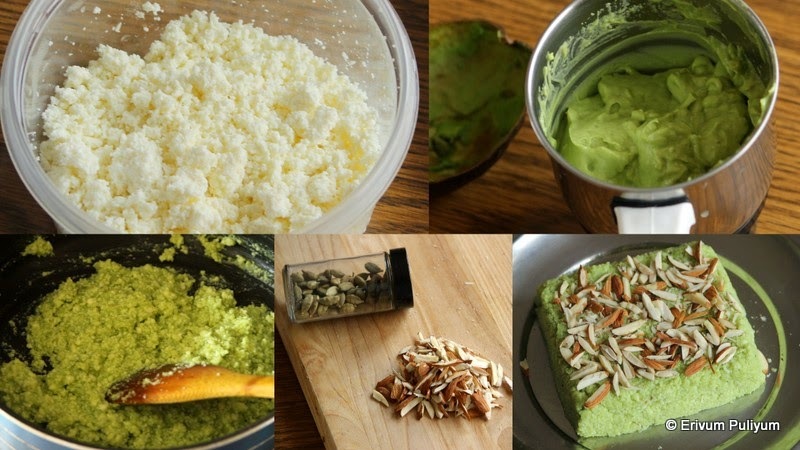 Wow love the color and recipe of Avocado kalakand. Hi Julie...congratulations on the 1M views... that is definitely a landmark... I had a question- traditionally the kalakand is made with either reducing milk or adding condensed milk... I am assuming since this is a healthy version, you have avoided it... but did this cause any issues in the flavor or texture? Thanks for visiting.. I didn't find any fair change in texture or taste. I have tried Roast Kalakand before from BK Rasagola, those were really great. I would love to try this too. And I might make it at home on some festival.